There are many symptoms of thyroid problems. These symptoms can overlap and mimic other conditions such as adrenal fatigue or fibromyalgia. By learning about the thyroid gland and the most common symptoms of thyroid problems you will know if its time to talk to a professional about your symptoms. The thyroid gland is an endocrine gland that is located on the front of your neck just behind the depression where your collar bones meet. It is responsible for metabolism and produces the hormones T3 & T4 also known as triiodothyronine & thyroxine. It also produces calcitonin which helps to regulate calcium levels in your blood. The most common symptoms of thyroid disease fall under two categories: hypothyroidism and hyperthyroidism. Common hypothyroid or underactive thyroid symptoms consist of fatigue, weight gain and fuzzy thinking. Other symptoms of include depression, joint pain, and constipation. The most common overactive thyroid symptoms include rapid weight loss, anxiety and insomnia. Other symptoms of thyroid problems related to hyperthyroid include rapid heart rate, diarrhea, and visual disturbances. Sometimes you can have symptoms of both hypothyroid and hyperthyroid which may be indicative of Hashimotos which is one of the autoimmune diseases or adrenal insufficiency. The only way to know for certain if your symptoms are related to your thyroid is to have a blood test for thyroid to measure all of your thyroid hormones. It is common practice to measure only TSH but if you have many of the symptoms listed above it is best to have T3 and T4 measured as well. 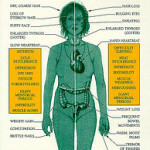 Specifically the free T3 and T4 (ft4) levels give the most accurate picture of how your thyroid is functioning. The results of the tests will determine your normal thyroid levels. Once you know your TSH, Free T3 & T4 levels you can see whether your symptoms are caused by your thyroid gland. If so, there are natural ways to treat this with either prescription natural thyroid medicine or over the counter bovine thyroid glandulars and herbs.